It looks like NBC's looking to turn another movie into a TV show, as a TV adaptation of the 90s comedy Problem Child is in the works. So, are they going the Parenthood route, in turning the comedy into an hour-long series that's much more of a drama? Or are they taking the About a Boy avenue, in aiming for humor with a half-hour format? As it happens, it's the latter. THR reports that The Hangover II's Scot Armstrong is adapting the 1990 comedy for a single-camera half-hour comedy. NBC has given the project a script commitment, so it sounds like this is in the earlier stages of development. For those who don't remember the original film, Problem Child starred John Ritter and Amy Yasbeck as Ben and Flo Healy, a married couple who adopt the seemingly adorable Junior (Michael Oliver), a mischievous kid who torments his new parents, while secretly pen-palling around with a serial killer played by Michael Richards. Gilbert Gottfried played Igor Peabody, the man responsible for matching Junior with his new family. And Jack Warden played Big Ben Healy, Ritter's character's father. The concept is simple enough that it seems like it should work well for a TV series, should this project make it all the way to air. There's a certain Dennis the Menace quality to the story, though Junior's intentions were always a bit more malicious than Dennis's. Although, Dennis did befriend a criminal in the 1993 movie, come to think of it... Back on topic, it's not hard to picture the concept developed as a TV comedy. At the very least, it'll be interesting to see who's cast to play Ben and Junior if this script eventually leads into a pilot order. Upon hearing news that a Problem Child adaptation was in the works for NBC, my first thought was to wonder if they might be going with an hour-long format. 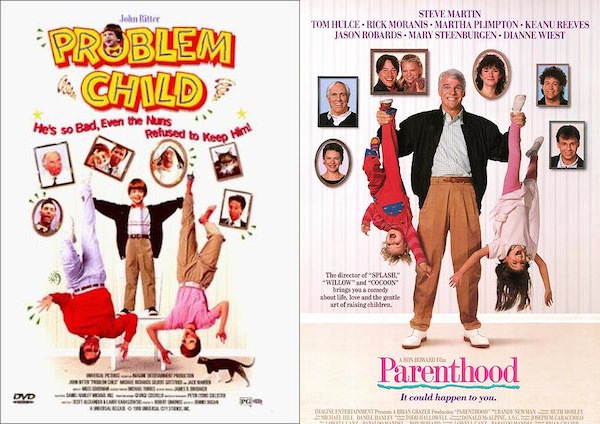 It worked out well enough for Parenthood, which was adapted from a 1989 feature comedy (with some drama) starring Steve Martin, Rick Moranis, Mary Steenburgen and Dianne Wiest. The NBC Parenthood is fixed firmly in the drama category, but who knows what it might have become if it had been developed as a half-hour comedy instead. The concept could certainly have gone either way. As a fan of NBC's Parenthood, I have no complaints at all about the way Jason Katims developed the concept for the small screen, but it's still fun to wonder. For the record, Parenthood came out first, releasing into theaters in August of 1989. Problem Child arrived nearly a year later (July 1990). Both were Imagine Entertainment/Universal films.